If there is a visual equivalent for the expression “doesn’t mince words,” it would apply to the latest collection by Catskill photographer John P. O’Grady. Books with new Catskills photographs aren’t exactly thick on the ground, so one does well to pay attention to a collection by O’Grady, whose way with words (he wrote the texts as well) is as unique and original as his artistry with a camera. Lush and beautiful in the summer, at least to those who (like me) travel their more familiar paths, New York’s Catskill Mountains in winter—and winters here are long—are harsh, stark, uncompromising. It’s difficult to imagine an artist who has conveyed these qualities more successfully than John P. O’Grady in his latest book, Certain Trees in the Catskill Mountains. Even the title is bare and direct. This isn’t a “feel-good” collection of pretty pictures; viewers in pursuit of the pleasant will likely find it daunting. The texts (photos and texts are printed on opposite pages) offer interesting insights and unusual takes on Catskill history and lore. For example, he points out the irony that there are no vistas on Mount Thomas Cole (Cole, the nineteenth-century landscape painter and an avid mountain climber, never scaled this peak): they are all obscured by trees. He also shares some information gleaned from a seventeenth-century alchemist: O’Grady has an interesting library and intriguing ways of shelving his books that reveal more about him than about the book itself. The photographs are black and white and rely on strong forms for their impact: jagged, winter-bare trees, sometimes cast as shadows on an abandoned building or on ground seemingly untouched by human or even animal life. Then there are the rocks, the Catskills themselves, the ledges that may offer a breathtaking vista or threaten instant death if the careless hiker slips and falls over the edge. Each photo is an accompaniment to rather than an illustration of the text. There are no verbal clues to the location of each image, and to recognize it solely by the visual, one must know this place very intimately indeed. In a book measuring 9 ½ x 8 inches, each photo averages about 4 3/8 x 3 inches; there are both verticals and horizontals. Thus each image seems to challenge—or perhaps dare?—the viewer to enter its world. To do so physically is for the physically adventurous; to do so visually through O’Grady’s photographs is for those unafraid to inhabit, even if just for a time, the mysterious and magical world that these pages set before one’s eyes. 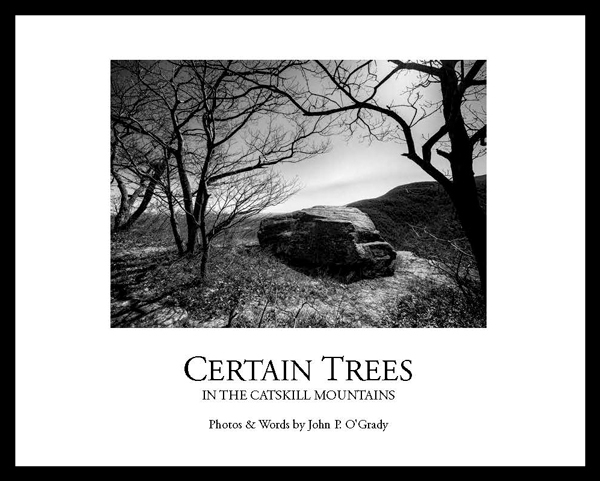 Certain Trees in the Catskill Mountains can be ordered through John O’Grady’s website, www.tuckabold.com. At $15.00 + $3.00 postage, this compelling journey into the saga-spun Catskills is a bargain. The Hudson River School of — Photography??? Want to make your photographs look like a masterpiece by a famous artist? I used to (half jokingly) dream of the day when a click of the mouse could turn a photograph into a work of art by one of my favorite painters. These days, thanks to plug-ins and programs from Topaz Studio and other places, I can pretty well do just that — well, almost. If you want to produce your own Rembrandt, Degas, Van Gogh, Cezanne, even Da Vinci, the software is there. But, wedged as I am between the Hudson River and the southeastern Catskills, my dream has me pursuing the artists whose work inspired me to live here in the first place: the 19th-century landscape artists known as the Hudson River School. If you want to produce your own Thomas Cole, Frederic Church, or Asher B. Durand, the presets don’t exist (at least, not yet). But that’s OK — because if you’re determined enough, you can use your own ingenuity to figure out how to do it, and in the end, that’s really more satisfying. Take the painting — I mean, the photograph above. It’s of a lake in the Woodstock area, and I photograph there frequently. In the 19th century, Hudson River School painter Jervis McEntee, when he wasn’t painting in or near his native Kingston, used to roam that area and produced a couple of paintings of it. McEntee’s rather subdued style, coloristically speaking, appealed to me as a corrective to my occasional tendency to post-process my photos in grungy, gritty ways, and I decided to see if I could derive inspiration from my 19th-century neighbor. This image was processed using a combination of a Nik Color Efex Pro preset and a filter on Photoshop CS5. It took some trial and error and in fact I ended up with two or three different final versions, but this one is my favorite. It was also a favorite of Robert Langdon, owner of the Emerge Gallery in Saugerties, because he has chosen it to be exhibited in the gallery’s show, “Exit 20,” opening on Saturday March 3. A wonderful variety of talented artists in all media will have their works on display, so if you’re in the area while the show is running, do come along to enjoy it. Hope to see you there! The foliage here in the Northeast has been a bit of a bust this year, but the marshes, with their autumn-golden grass, never disappoint. I got to photograph two marshes during a brief trip to Rhode Island last week–one from the little parking area at the Coggeshall Farm Museum in Bristol and the other a hidden gem on Jamestown island. These images are quickly processed from the jpg versions. When I have time, I’ll give them (and others) the full treatment, putting the Raw files through Lightroom and then Photoshop. The image at the top of the page shows the marsh visible from the Coggeshall Farm. The sky during a break in the almost relentless rain on this day added some drama. The marshy land in the Great Creek was quite a discovery. I was on my way to photograph the famous Jamestown Windmill and happened to pass this. The windmill was quite close by, so it was easy to turn around to go back to the creek, which had its seemingly statutory now-closed-for-the-season seafood shack in whose parking area one could stop. –you were right! The Pell Bridge, which connects Aquidneck Island (on which Newport lies) with Jamestown island. I got several shots but like the way this one includes the flag. If you’re in (or visiting) the Hudson Valley during November, we’d love to welcome you to an art show opening at the Emerge Gallery on Main Street in Saugerties. The theme is “Petit”–it consists of smaller works of art–and I have two pictures in the show. In addition to the framed works on display, a variety of matted prints is also available for sale.